City Tattersalls’ annual club Tall Tales contest was held on Tuesday 8th October. The contest is an opportunity for club members to have a bit of fun while practicing their speak skills. The four contestants were Richard, Dilip, Martin and Lila. Many tall tales were told. In the end, Lila swept the audience (and the judges) away with her tall tale and took the first prize. Congratulations Lila! The Club level contests held on Tuesday 13th August 2013 attracted four members in the Humorous Speech contest and six members in the Table Topics Contest. 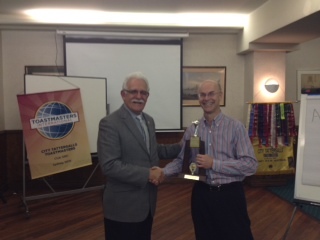 Matt Tonkiss took the first place in the Humorous Speech contest, while Peter Anderson won the Table Topics contest. Congratulations to Matt and Peter! The winners will go on to compete in the Area 49 Humorous Speech and Table Topics Contest, which City Tattersalls will proudly host on Wednesday 4 September at 6:30 pm. City Tatts did very well at the Lachlan Division contests tonight. Two podiums. Philippa came 3rd in the Evaluation contest. And Matt came 2nd in the International Speech contest. Congratulations to both: what a great achievement at this high level of competition! Our Club Evaluation and International Speech Contests on Tuesday 26 February were a great success, with some excellent evaluations and speeches all round. Congratulations to Kirrilie Oates for winning the Evaluation Contest and to Matt Tonkiss for winning the International Speech Contest. As Kirrilie also won the Evaluation contest at her other club (Ashfield), she is allowing our runner-up Philippa Duflou to represent our club at the Area Contest. The Area 49 contest will take place on Wednesday 3 April. Please mark your diaries for this event, so we can all come and support Philippa and Matt at this next level of competition.. It is with the greatest sadness that we announce that Tony Zammit passed away suddenly this week-end. 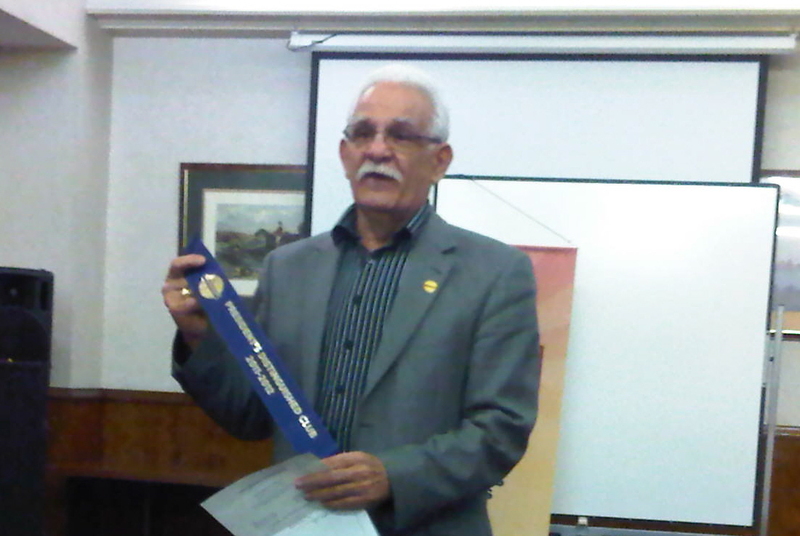 A past District Governor, Tony joined the City Tattersalls club in 2008. From the moment he joined, Tony has been a tireless servant and mentor to our club, always showing great enthusiasm, leadership and good humour. Under Tony's presidency last year, City Tattersalls achieved the President's Distinguished Club award from Toastmasters International. Tony continued his great commitment to the club by serving as both VP Membership and Treasurer on the executive this year. Words cannot express our loss. We will miss you Tony. 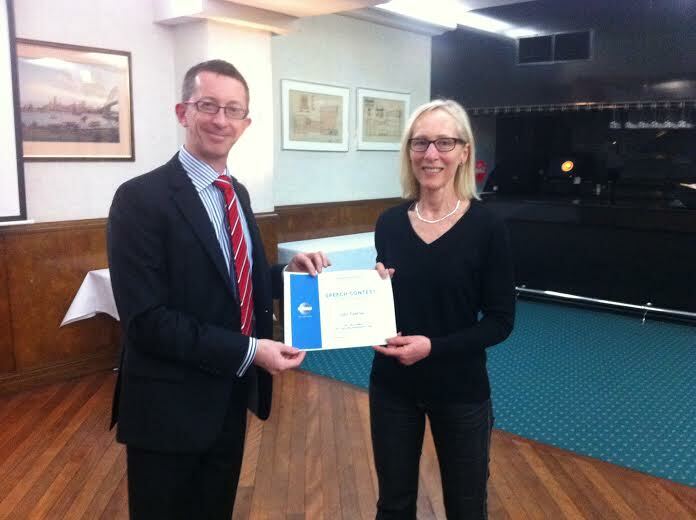 The City Tattersalls Toastmasters Club announced its Toastmaster of the Year for 2011/12. In a small ceremony the Immediate Past President Tony Zammit DTM presented Jean-Marc Schwob ALB with the prestigious award. This is the second time in three years that Jean-Marc has won this award, which is presented to a member who shows extra-ordinary support to the club. Although not a member of the club executive last year, he was always ready to support or advise every member throughout the year. Jean-Marc was also instrumental in changing the club website to the new rebranded model of Toastmasters International, subsequently, City Tatts TM was one of the first clubs in the world to change within hours of the official launch on the 18 August 2011. Having won the Area 49 Contests in September, City Tattersalls Toastmasters members Adam Sives and Paul Woodward represented us at the Lachlan Division contest on the 7th of October. Adam competed in the Humorous Speech Contest with a hilarious presentation entitled "That's what I should have said". And Paul provided a great improvisation on the Table Topic: "I embraced modern technology when…". Well done to both. You did us proud at this very high level of competition, against some of the best speakers in Sydney.